Tania Vaughan: Is your net empty? There are days when I feel like the fisherman in Luke 5:5a must have felt. They had been hard at it, fishing all night but hadn't caught a thing. Some days it feels like I have being constantly on the go and giving out until I feel weary to the bone. It is often at this time that I receive a call from a friend in crisis or someone pops round that is in need. I can't help it, my immediate thought is 'I can't give any more, I'm done in, I'm tired, I don't want to'. I've been going all day and my net is empty. In the second part of verse 5 I am challenged by Simon's response. He explains that he's already tried, he possibly didn't think there was much point, he may well have been tired but he agrees because Jesus says so. What a challenge to obedience. When I've been working and giving all day and someone asks for more I want to respond as Simon did to Jesus, because when someone comes to me in need then it is Jesus that wants me to reach out to them, no matter how I feel. 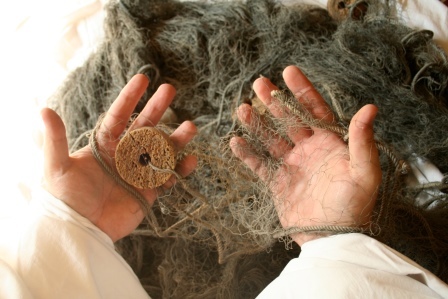 Simon's story becomes a blessing as his nets are filled to overflowing with fish. In the same way were are blessed when we trust in Jesus and are obedient in giving a little bit more. God fills us. Not just with the compassion, love and energy we need for that one situation but so that we overflow and feel the love and energy fill our own hearts. When you think that you have nothing left to give, let Jesus take you deeper and you will be filled to overflowing.